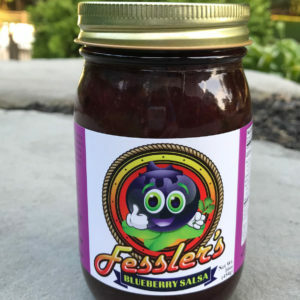 This would have to be the easiest recipe ever! No Really! Take some corn chex and place it in a mixing bowl. I used about 4 cups, as that was all that was left in the box. Spray some cooking oil on it; like Pam Original Cooking Spray. 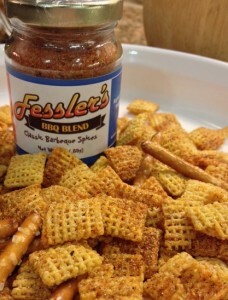 Sprinkle on some Fessler’s BBQ Spice Blend. Mix and repeat until you are satisfied with the coverage of the spices to the ratio of the cereal. Place in the oven at 300 degrees. I think it was at least 10 minutes, but quite honestly- I kinda forgot about it and only took it out of the oven when I started to smell the spices. At that moment I said, Oh S@%*! But it was OK. I let them cool and put them in a bowl. I added some pretzels, but you could add whatever you would like. This makes a super duper easy salty snack mix that disappeared quickly. Take your Fried Shrimp to the next level!